There are lots (and lots) of companies that provide contractors to school districts, each of us offering a little something different. One thing that is the same no matter who you work with, though, is that you’re asked to sign a contract. 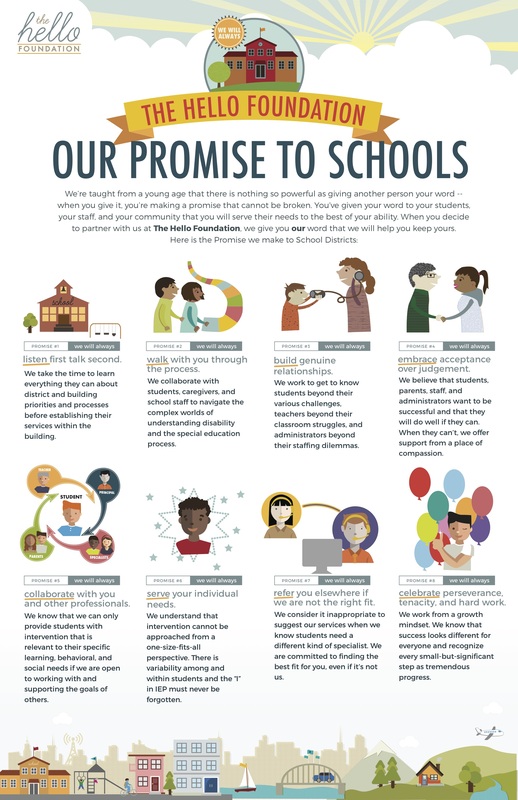 It’s usually full of lots of words that are really important to keep things on the up-and-up legally, but that don’t really amount to much when it comes to what the actual commitment will be to students and staff. That just didn’t seem right to us, so we came up with what we call The Hello Promise. We will always listen first talk second. We take the time to learn everything we can about your district and building priorities and processes before establishing our services within the building. We will always walk with you through the process. We collaborate with students, caregivers, and school staff to navigate the complex worlds of understanding disability and the special education process. We will always build genuine relationships. We work to get to know students beyond their various challenges, teachers beyond their classroom struggles, and administrators beyond their staffing dilemmas. We will always embrace acceptance over judgment. We believe that students, parents, staff, and administrators want to be successful and that they will do well if they can. When they can’t, we offer support from a place of compassion. We will always collaborate with you and other professionals. We know that we can only provide students with intervention that is relevant to their specific learning, behavioral, and social needs if we are open to working with and supporting the goals of others. We will always serve your individual needs. We understand that intervention cannot be approached from a one-size-fits-all perspective. There is variability among and within students and the “I” in IEP must never be forgotten. We will always refer you elsewhere if we are not the right fit. We consider it inappropriate to suggest our services when we know students need a different kind of specialist. We are committed to finding the best fit for you, even if it’s not us. We will always celebrate perseverance, tenacity, and hard work. This is what you can expect from every one of us at Hello, every day. It’s our honor and privilege to serve you. Want to learn more about who we are and what we do?